Most school curricula feature courses on World History, US History, and Local History, which makes a lot of sense. There are some common historical milestones that had worldwide impact, such as the World Wars, others more important to the country we live in, such as the succession of presidents, and then there are local heroes, for example Madam C.J. Walker from Indianapolis who became the first female Millionaire of color with the invention of her special hair product. 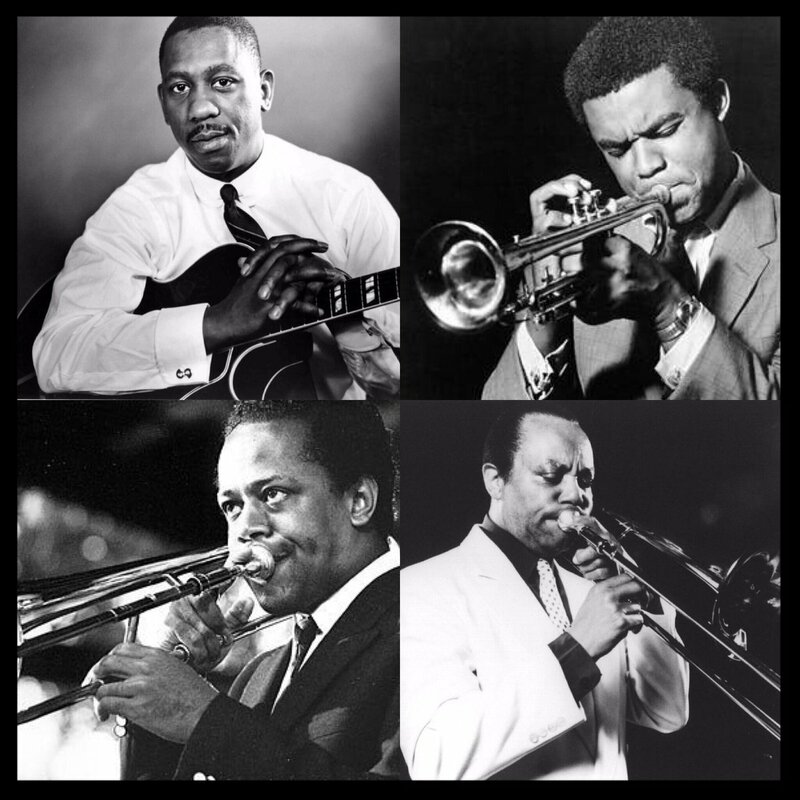 I propose that we should teach jazz history with a similar distinction: Jazz History – US Jazz History – Local Jazz History. Every region has their unique scenes and performers who contributed to the identity of a place as well as to the canon of the art form. 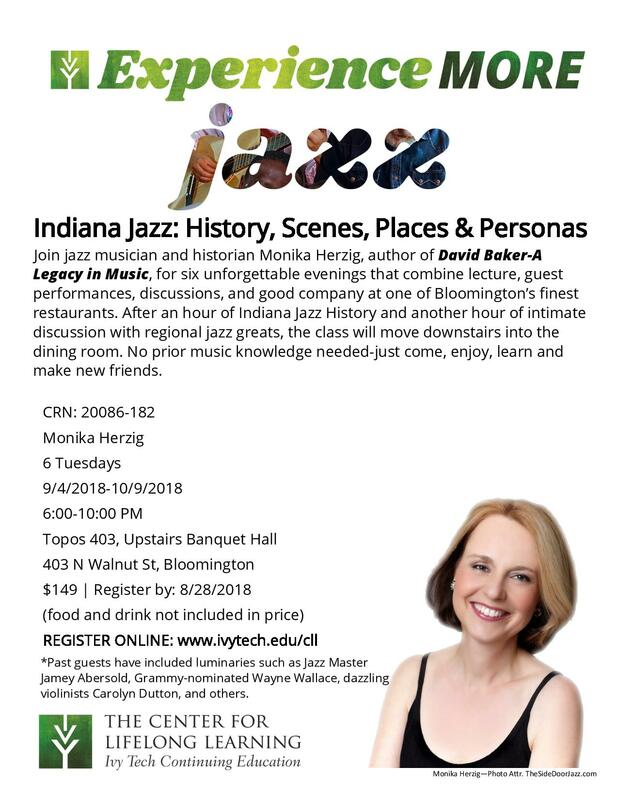 I have taught classes on the Indiana Jazz Legacy for years, showcasing well-recognized artists such as Wes Montgomery, Freddie Hubbard, J.J. Johnson, Slide Hampton, David Baker, Larry Ridley, Cole Porter, Hoagy Carmichael, Gary Burton as well as regional heroes, i.e. Everett Greene, Mike Lucas, Janis Stockhouse and so many more. Throughout the journey we discover the unique identity of a place and community and a sense of pride and belonging. 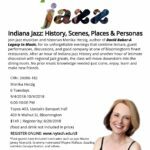 In fact, the next issue of “Indiana Jazz: History, Scenes, Places, and Personas starts on September 4 and is open now for enrollment through Ivy Tech’s Lifelong Learning Center. 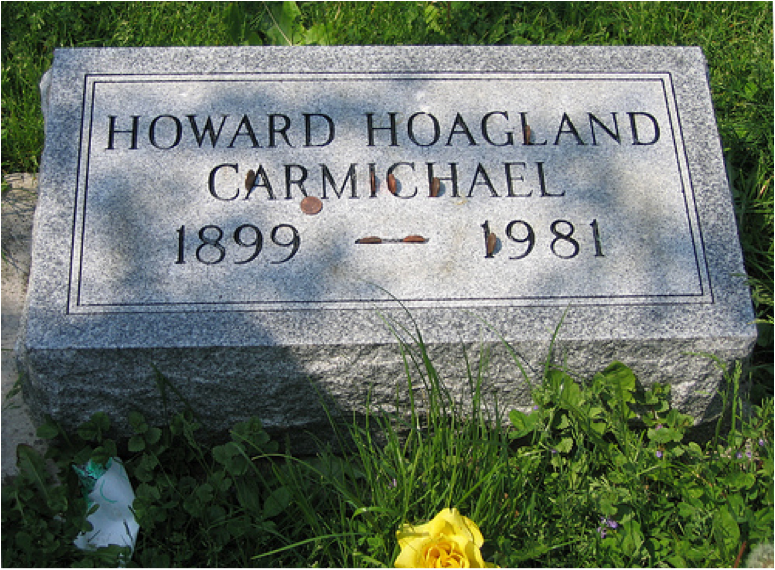 Of course, a very special legacy for Bloomington, Indiana is songwriter/ pianist Hoagy Carmichael who grew up on Grant Street close to Indiana University and is buried at Rosehill Cemetery. He wrote many hit songs, i.e. Stardust and Georgia, participated in Hollywood Movies, hosted The Saturday Night Review, and received an Honorary Doctorate from Indiana University in 1972. His son Hoagy Bix Carmichael is currently working on creating a major Musical showcasing his father’s music. 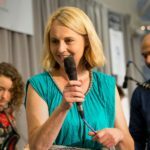 The initial workshop and showcase will be in Bloomington throughout August with Hoagy Bix present – performances August 15-18 at the Wells Metz Theatre, more info here. 1. Lazybones – written in 1933, his first collaboration with the great lyricist Johnny Mercer. This was one of his bestsellers, often attributed to the authenticity of the hints to southern living by Mercer who is from Savannah, GA. Mercer came to Carmichael’s apartment and saw him snoozing on the couch. He announced “I’m going to write you a song called Lazybones” and they proceeded to do just that in 20 minutes. 2. Winter Moon – one of Hoagy’s later compositions, written in 1957 with Harold Adamson. A haunting melody with the words lamenting lost love is framed with an unusual form of 28 bars. It became the title track for Art Pepper’s 1981 recording with strings, arranged and conducted by Bill Holman. 3. Georgia – Frankie Trumbauer suggested to Hoagy to write a song about the State of Georgia in 1930, although Hoagy also had a sister named Georgia who is sometimes attributed as the subject of the song. Ray Charles recorded the song in 1960 on his “The Genius Hits the Road Album” and it became a major hit, reigning #1 on the charts for a week. Ray Charles is a native of Georgia and the State eventually adopted it as their anthem. 4. Stardust – arguably Hoagy’s most famous piece, one night in 1926 in Bloomington he started whistling a tune and ran to the Book Nook to further refine it. 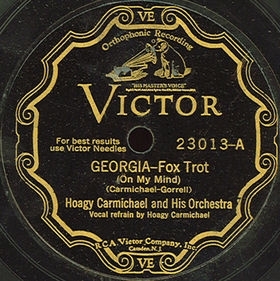 The two initial recordings at Richmond’s Gennett studios in 1927 and 1928 with Hoagy’s own lyrics were not successful and performed at a medium tempo. The first hit version by the Isham Jones Orchestra featured lyrics by Mitchell Parish and became a sensation. It now is one of the most recorded songs in history. 5. Skylark – another collaboration with Johnny Mercer, this one didn’t come as easy as Lazybones. Johnny Mercer struggled with the song for a year until he felt he had the lyrics right. The longing in the song is presumed to be Mercer’s longing for Judy Garland with whom he had an affair. Published in 1941, the song inspired a long-running Buick model and was recorded by many prominent vocalists including Ella Fitzgerald, Bob Dylan, k.d. lang, and Bette Middler. 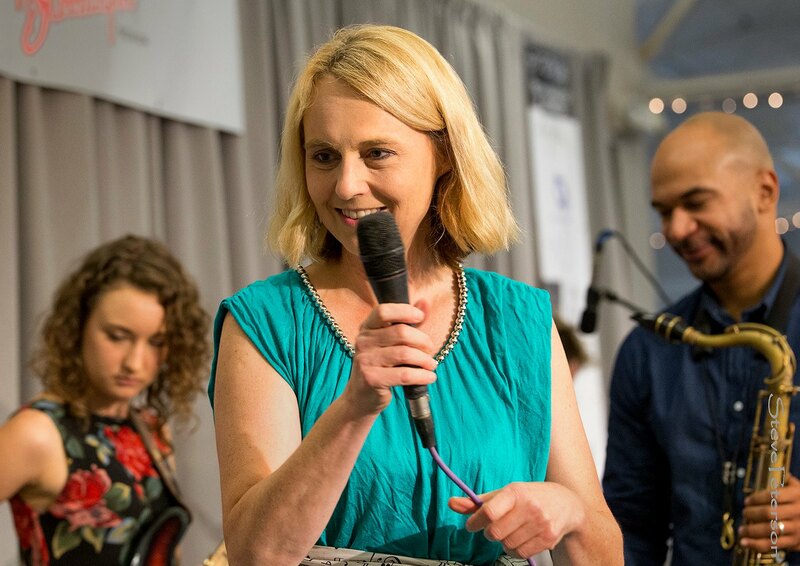 See you Saturday, August 18, 5pm when we celebrate Bloomington’s own Hoagy Carmichael with remarks by Hoagy Bix Carmichael and music performed by Tom Clark – saxes, Carolyn Dutton – violin, Janiece Jaffe – vocals, Monika Herzig – piano, Peter Kienle – bass, John Valdez – drums!